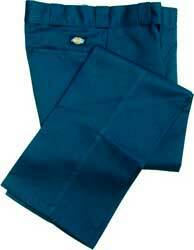 Dickies Original 874® Work Pants! Permanent crease, never needs ironing. Tunnel belt loops. Non-roll waistband lockstitched hem. Stain release finish. Flat front. Unfortunately due to Dickies request we are only permitted to ship Dickies products to addresses in the United States. Sorry!